How very cool! I think your DH is right, the right thing will come along at just the perfect time. funny how it works that way. Pretty cabinet! 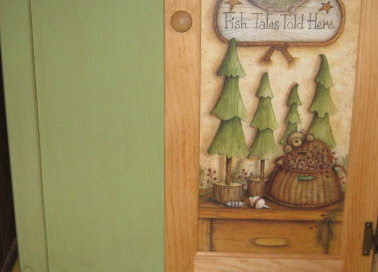 I have a kitchen with green painted cabinets and have found it quite easy to live with. No worries, it's not the kiwi green of the bathroom! 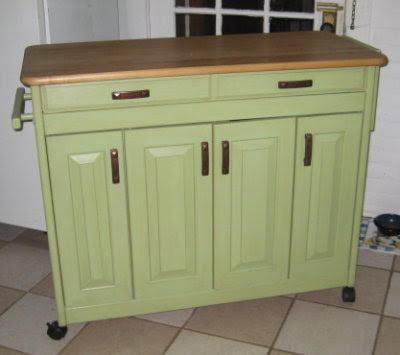 As you work and modify your kitchen plan, see if you can keep that a rolling cabinet. They can be awfully handy to have. Oh gosh, you have to beef up floor joists in a crawl space. Now that doesn't sound like a lot of fun. Will it mean you can remove that post in the kitchen or help with moving the fridge into a different spot? I certainly do not envy you bathroom renovations, but am looking forward to seeing the living room and dining room full views soon. Exciting on the new dining room floors! Michelle, I usually do my kitchens in blue because of my Blue Willow. But when we found those Amish cabinets I knew I was ready for a change. When we got this piece, I fully expected I'd have to strip it or paint it, but what a delightful surprise to see how well it matched! Renee, I confess, I take a "break" with computer games! *LOL. When the right stove finally comes along, I will be very excited and you all will be the first to know! Its good to take your time then you'll know just what you like and how it will feel in the space. I love the green! That cabinet is great, and a butcher block top what a find. You sure did find a great buy! The color is perfect. You'll the find the stove you want when you least expect it. This looks perfect! Old-fashioned, good quality, and very practical. leigh, check out antiquestoveheaven.com they may have what you're looking for. nice little island by the way, pretty color. What a great cabinet. It looks very practical and it is gorgeous to boot. ;-) I think it is lovely to be able to take your time figuring out what works for you in your space. I am in my kitchen a lot and it is very important to me to have a good, roomy, workable kitchen as well as one that is easy to clean and keep organized. (Pantry a must!!) In our old home I had finally put in a farmhouse type huge white 2 basin sink and now I really miss it, especially at canning time. Great find on Craigslist!! That green is a really pretty color! Good luck with the next projects!! Theresa, duh, I just realized that I got distracted and didn't answer your question. That post in the kitchen is there because of problems in the attic; I'm not sure if it's the joists or rafters (DH explained it but I'm not quick to comprehend building stuff). Anyway it's there to support the kitchen ceiling rather than having anything to do with the floors. When we get to the kitchen, I'll have him get photos. Julie, I have to admit that I'm pretty slow at decision making anyway, so actually this suits my personality. Patience on the other hand, is sometimes a struggle! DeepEnd, Barb, and Charlotte, thanks! I have to confess though, that I look at Craigslist almost every day for that stove. Anonymous, thanks for the link! What a neat site. I wish they'd post some prices though. And I wonder about shipping from California. Still, I've got it bookmarked and appreciate the info. Sue, I would love to take some breaks! *LOL. That pile of flooring in the living room and a bare dining room are pretty motivating however. I admit that I do love this though. Sometimes I think I should have majoried in interior design in college, rather than music and nursing. That cabinet is a great find you'd never know that it wasn't planned along with the cabinets. I like rolling work spaces and have a small one I use when I weave.